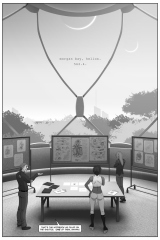 Sans squelch, The Operative is 109 strips, putting DCR at 60 pages (58 actual). Nice to end on a prime number – also nice to land on the one-year paper anniversary of my change in employment status (from Work 1.0 to Work 2.0). The rest of my life is being a bit more Timely and Appropriate than usual lately, which fits nicely – were I my usual hyper-hermit self, these pages would have been assembled and posted days ago, with little personal significance or fanfare. Strip 230 – While I’ve recently rewatched The Young Ones, Thad’s lines date back to late 2009 or early 2010 – whichever it is, the last strip of the previous page and this page in its entirety predate the “gold master” of the production script for the last two scenes of the chapter by several months. As such, it feels particularly good to finally see this bit realized. It feels VERY METAL. Strip 231 – The production script has Ornix’s line in the next strip. It works better here. Strip 232 – No crowd, but plenty of photoshop background rendering. I may go back and add a crowd in at some point – my existing crowd files are all knees-up or shins-up, which doesn’t work well in this situation. However, chapter three scene two will benefit enormously from a fully rendered full-height crowd file. Whenever that’s generated, I may come back to this strip and throw them in to bulk things up a bit. Until then, consider the general emptiness to be a lull in the insanity of a student apartment move-in day. 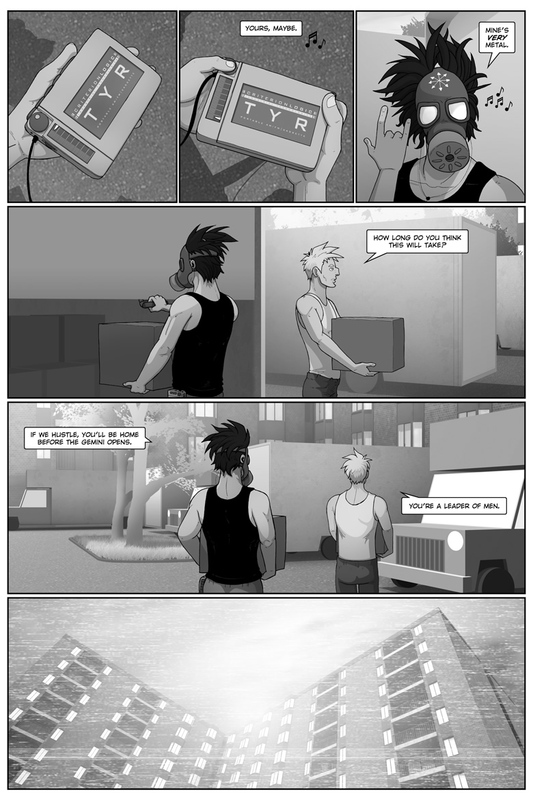 Strip 233 – A “traditional” exit, in the style of the Static strips of DCR.1 and the finale of that chapter. This should be the final DCR strip – I plan for Chapter Three to be assembled and posted to the ATC site in page format. At some point in the near future the DCR website will be repurposed – not a “version two” so much as a “no longer a blog” or a “totally different blog.” I have a lot of paper-think done on the subject and should have something implemented or near to it by the end of 2010. The art and initial script of the first four pages of The Operative were produced in 2008, followed by a year-plus production hiatus while I hacked out the second edition of The Dualist. DCR.2 production resumed with a page post on 2010.04.18 (a delightfully appropriate date, by this calendar and ATC’s internal kabbalah), struggled off and on throughout the summer, and finally hit its stride in late October. Today is noteworthy. EVERYTHING BEGUN IN 2008 IS NOW COMPLETE. The first full draft of the chapter three script was finished on 2010.11.02 and is so solid that one or two passes should polish it up. The CG should be minimal, the photography is on hold until spring of 2011, the cover and title have been decided on and will follow soonish. Next up? Backups, data restructuring, and a breather of Exactly The Right Length. ATC presently stands at 470 pages (454 actual). 102 queries in 0.785 seconds.